This set of MATLAB Multiple Choice Questions & Answers (MCQs) focuses on “Calling External Functions”. 1. What is the function of the mexext command? Explanation: The MEX file, generated in MATLAB will have an extension which depends on system configurations. Hence, the above code returns the extension of the MEX file when generated from the current system. Explanation: The mexext file is misspelled with the ‘M’, it should’ve been small. The MEX extensions would’ve been shown if the command was written properly. 3. What is the output of the following code snippet? Explanation: It shows the version of the system where MATLAB is installed currently. Explanation: The above command typically loads a C library with all the header files and the functions so that they can be used in the MATLAB code. 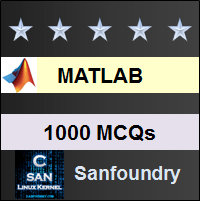 Explanation: The callib command is defined in MATLAB to use a function which is in a pre-loaded C library. The function can be called by giving the function name and the arguments as an input to the callib command. 6. What is the working of the following command? Explanation: The above command returns the functions, in a library- the library name is given as an input to the command. The library is to be pre-loaded with the loadlibrary() command. 7. What is the working of the following command? Explanation: The above command returns both the set of functions present in the shared C library and the signature of each function in the pre-loaded library. 8. What is the working of the following command? Explanation: The above command returns the signatures of the functions present in a library. The library name is given as an input to the command. Explanation: The libfunctionsview command works only on a library that has been pre-loaded into MATLAB with the loadlbrary() command. 10. What is the working of the following command? Explanation: The above command returns a 1 if it finds that the library, given as an input to the command, is pre-loaded in the system. 11. Which of the following command unloads a library from the system? Explanation: The correct command to unload a library is unloadlibrary(). It is syntactically correct and no misspelling. 12. The isjava command returns? Explanation: The isjava command will return a 1 if the input to the command is a java object. It would return a 0 otherwise. Explanation: The input to the isjava command should be given within parentheses. It would return an error otherwise. Explanation: The above command checks if the input given to it belongs to the MATLAB class. If it’s so, it’ll return a 1- else it’ll return a 0. 15. Python files cannot be used in MATLAB. Explanation: Python files can be used in MATLAB. Python commands cannot run in MATLAB without Python in the system. 16. Python commands can be run in MATLAB without Python in the system. Explanation: A version of C python is required to be present in the system for python commands to run. Hence, the above statement is false.